Migrant Heroes depicts Hugo Morales, a Mixtec Indian from Oaxaca, Mexico, who as a child immigrates with his family to the U.S. A California farmworker at first, he eventually graduates from Harvard Law before creating Radio Bilingüe - a trilingual radio station that caters to the needs of indigenous immigrants. The film explores his life and work, through animation and documentary elements. 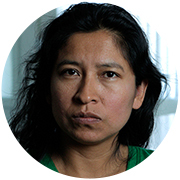 Yolanda Cruz is an independent filmmaker from Oaxaca, Mexico. She is a 2011 Sundance Screenwriting and Directing Lab Fellow and an alumna of the Sundance Institute Native Lab. Her work has screened at the Sundance Festival, the Guggenheim Museum, and Park la Villette in Paris. She holds an MFA from the UCLA School of Theater, Film and Television. Her feature, La Raya (produced by Canana Films), is currently in development.